From concrete to cement, brick to stone. Everlast Construction & Painting LLC has been providing masonry services to local business and homeowners since 2000. 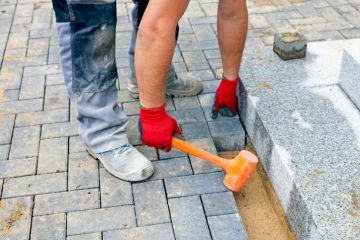 Whatever hardscape project you may have for your residential or commercial property, Everlast Construction & Painting LLC is a leader in providing exemplary masonry services. Whether you need a retaining wall fixed or want to turn your backyard into a personal oasis with a hand-made patio, call the experts at (973) 333-4540. Want to improve the curb appeal of your house? Or beautify your outdoor living space? Everlast Construction & Painting LLC provides simple, reasonably priced, low maintenance solutions to updating and enhancing your outdoor space. Whether it's stone entryway steps, a newly built patio or an outdoor kitchen you're after, Everlast Construction & Painting LLC has the expertise to complete your project on time and to your specifications. If you are looking for a commercial mason to build or repair structures on your business property, we can handle that too. Everlast Construction & Painting LLC can provide the skilled manpower and appropriate equipment to complete your commercial masonry project with minimal interruptions to your operations. Call (973) 333-4540 to learn more. Why Choose Everlast Construction & Painting LLC's Masons? Everlast Construction & Painting LLC has become recognized locally as a caring masonry contractor who provides professional customer service and skilled craftsmanship. No job is too small or large when it comes to residential or commercial masonry. Having been in business since 2000, Everlast Construction & Painting LLC has the experience and passion to work with you every step of the way to complete any masonry project on time and within budget. We can help you design to build your project to best suit your needs.